BCRAC’s Community Conversations series is focused on starting conversations that make a difference to community well-being and people’s lives, conversations that enlist the work of hope and resistance as strategic tools for achieving social repair. They begin by re-humanizing ourselves, individuals, and families and extending a warm hand of friendship to those in a daily battle with some profound social issue. 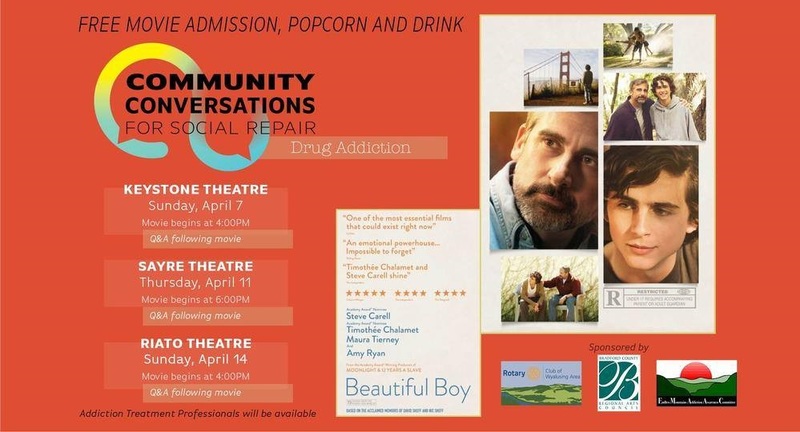 The first set of conversations to be held in April at all three historic BCRAC theatres located in Towanda, Canton and Sayre will begin with the movie, Beautiful Boy. Based on the best-selling pair of memoirs from father and son David and Nic Sheff, Beautiful Boy chronicles the heartbreaking and inspiring experience of survival, relapse, and recovery in a family coping with addiction over many years. “We hope that the movies we choose will create an opening for these conversations.” says BCRAC Executive Director, Elaine Poost. The Endless Mountains Addiction Awareness Committee (EMAAC) is partnering with the BCRAC in the first topic of the new series. Following the movie, EMAAC and the BCRAC will host a Q&A for the attendees in a safe and open environment. The focus is on the family and community, but addiction professionals will be available to anyone who needs their help. Poost promotes and believes in the idea that “it takes a village” to make raise families and create healthy communities. “We have the answers as a community and we need the place to have these important conversations, Bradford County’s historic theatres offer that place.” BCRAC, EMAAC and the Wyalusing Area Rotary Club are partnering to sponsor this first conversation within the community. 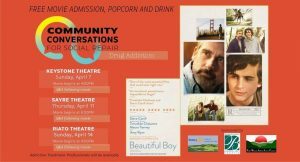 Beautiful Boy will be presented on Sunday, April 7 at 4 PM at the Keystone Theatre in Towanda, Thursday, April 11 at 6:30 PM at the Sayre Theatre, and Sunday, April 14 at 4 PM at the Rialto Theatre. The movie, popcorn and soda are provided for free by the sponsors. The BCRAC intends to offer this as a monthly series and plans to cover the subjects of caregiving, environment stewardship, and mental health as well as continue the conversation on the impact of drug addiction. The vision is that the conversations will inspire individuals to become active in generating ideas that will weave the county with a renewed capacity to create healthy, and welcoming communities. For more information, or to suggest future topics, contact the BCRAC at 570.268.2787. The BCRAC is a nonprofit organization dedicated to building and supporting a thriving arts community by: advocating for the arts, cultivating quality arts programs, and preserving Bradford County’s historic theatres for live performances, community events and movies.